There’s enough marinade in this recipe to coat up to 4 chicken breasts (or whatever other pieces of meat you’d rather have). 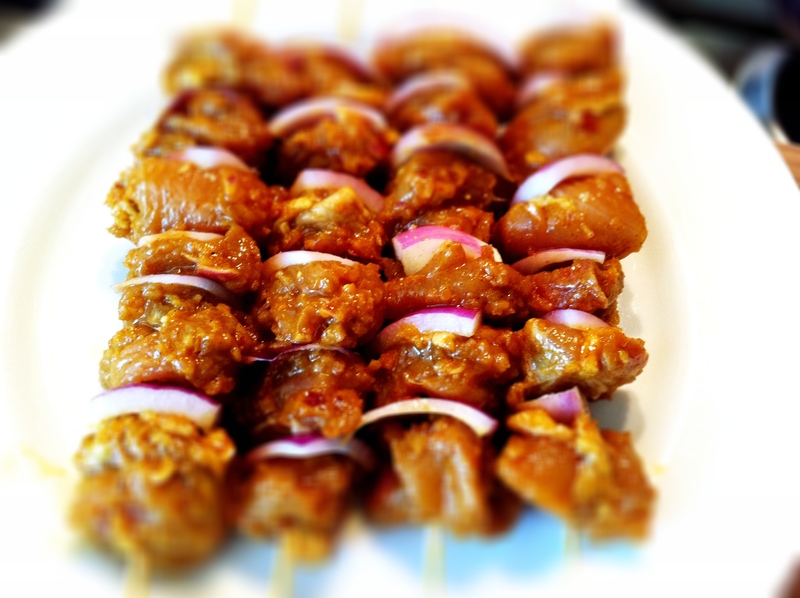 Soak about 8-10 skewers in water for two hours before you start skewering the chicken. Put all the ingredients into a large mixing bowl along with your chicken pieces and allow the chicken to marinate for at least 2-3 hours, ideally overnight. I’ve used chicken but this marinade works well with any meat. There’s quite a lot of marinade so you could split it into two bowls and marinade chicken in one and beef/lamb etc in the other – same marinade but a different taste based on what meat you choose. 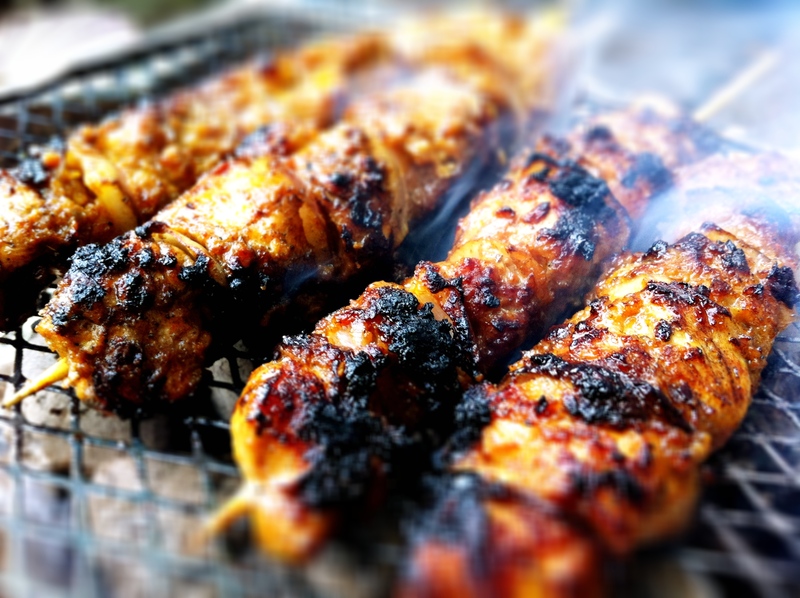 Remove your bamboo skewers from the water and skewer your chicken/meat. Barbecue or grill, turning frequently, for about 10-15 minutes until your meat is cooked through. 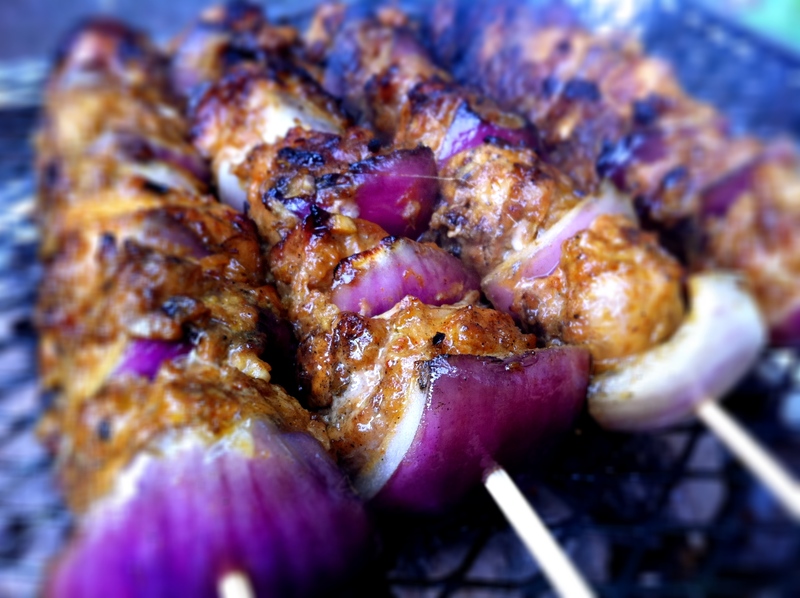 I’ve skewered my chicken satay with red onion pieces but feel free to add peppers or other vegetables (eg courgettes, mushrooms etc) to your kebabs. I used a disposable barbecue tray to grill these but a proper coal or wood burning barbecue would work best. Serve your chicken satay with fresh cucumber, slices of fresh onion, cold pressed rice (optional) and peanut sauce, and don’t forget to squeeze some fresh lemon/lime juice over them before you dig in.